IN a quiet corner of Kent, England, there’s a grade crossing where a big bump in the road could bounce an auto safely over the stack of the onrushing express. 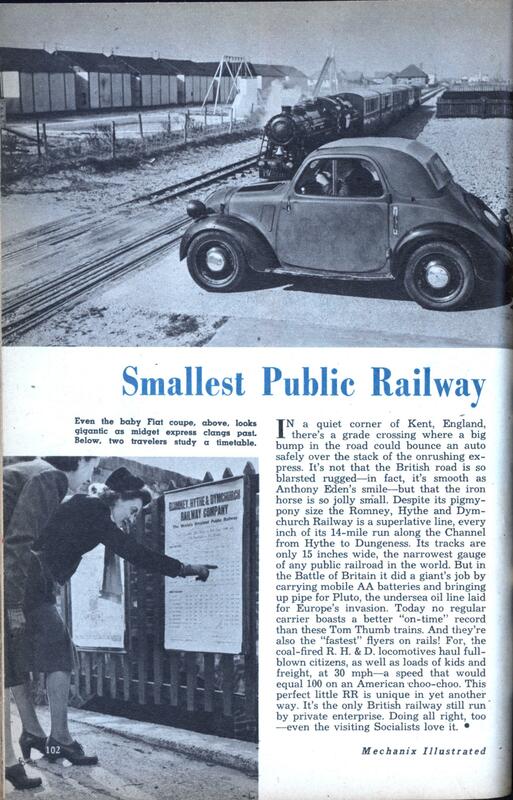 It’s not that the British road is so blarsted rugged—in fact, it’s smooth as Anthony Eden’s smile—but that the iron horse is so jolly small. Despite its pigmy-pony size the Romney, Hythe and Dym-church Railway is a superlative line, every inch of its 14-mile run along the Channel from Hythe to Dungeness. Its tracks are only 15 inches wide, the narrowest gauge of any public railroad in the world. But in the Battle of Britain it did a giant’s job by carrying mobile AA batteries and bringing up pipe for Pluto, the undersea oil line laid for Europe’s invasion. Today no regular carrier boasts a better “on-time” record than these Tom Thumb trains. And they’re also the “fastest” flyers on rails! For, the coal-fired R. H. & D. locomotives haul fullblown citizens, as well as loads of kids and freight, at 30 mph—a speed that would equal 100 on an American choo-choo. This perfect little RR is unique in yet another way. It’s the only British railway still run by private enterprise. Doing all right, too —even the visiting Socialists love it. I love how they try – and fail miserably – to reproduce English slang. Makes wonder why Frodo walked that way when he could just have taken the train? As well as taking tourists, the railway is contracted to collect children and take them to school – perhaps the only place in the world where the “school bus” is in fact a steam train. I love the mental picture of this little railway toting enormous AA batteries up and down the English coastline – of course, what they meant was Anti Aircraft guns mounted in groups (“batteries”), but I like the idea of a small train with huge Duracells better.